Comparison between the cut Japanese Laser Disc by JVD Laservision and the uncut version, taken from the German DVD by XT-Video. 6 minutes and 11,5 seconds are missing in 33 scenes. 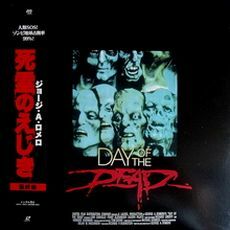 George Romero's "Day of the Dead" had a hard time with censors around the world due to its high violence level. In many countries, the uncut version was outlawed and/or cut movie versions with various lengths were released in order to reach a broader market. This comparison covers the Japanese market, where two different versions were released. The VHS and Laserdisc by Tohokushinsha / Toei Video were surprisingly only cut in one small scene, whereas harder footage in other places was left in its place. The Laserdisc by JVD Laservision, on the other hand, was cut in basically all of the violence scenes by six minutes and additionally outlawed in 1996. We do not know whether the uncut version was eventually released as well. The remaining running time difference results from the different running speed of the compared versions. The Japanese Version features a few more logos. The two chained zombies can be seen longer. The zombie on the stretcher is seen longer. Dr. Logan holds his hand in front of the zombies' mouth and retracts it when the undead guy tries to bite him. A zombie on the stretcher. Instead of his head, only his brain is still connected to his spine. The zombie on the stretcher with the open belly turns around and loses his intestines, which fall down to the ground. Sarah turns around while Dr Logan takes a drill and kills the zombie with it. Sarah dreams of Miguel in bed, turning around to her. His intestines fall out of his open belly. A zombie bites a piece out of Miller's neck. Miguel gets a piece bitten out of his arm. Miller holds his neck wound and asks Steel do kill him, which he does. Sarah chops Miguel's arm off with the machete. Another shot of the severance of the arm. She now removes the arm completely and then runs out of the picture while John bends over the stump, trying to stop the bleeding. The binding off of the arm can be seen longer, the following shot of Sarah also starts earlier. Sarah holds the burning torch to the stump. She removes the torch from the stump and then presses it against it again. McDermott looks at a corpse. After the blanket has been removed, a severed head, which is being kept alive by wires, can be seen. It moves its mouth. Another shot of the head. The zombie eats a piece of meat. Cut to Sarah and McDermott watching from behind the window. The zombies continues to eat and then looks straight ahead. The mangled corpse can be seen longer. The shovel is stuck in the zombie's mouth. After a shot of Sarah, McDermott pushes the shovel down and severes half of the zombies' head, which then rolls to the back. Sarah and McDermott run away. In the foreground, the halved zombie head can be seen still moving its eyes. A zombie is being shot without a lot of blood. A zombie is being killed with a bullet in the head. Another one approaches John from behind and then gets a headshot as well. The zombies bite into Miguel's neck and chest. The zombies tear off Torrez' head. Half of Rickles's face is torn off. Another zombie bites off a few of his fingers. Steel flees and shoots two zombies in the head. A zombie bites a piece out of Steel's neck. Three zombies are being executed by Steel. Steel pushes the pistol in his mouth and shoots himself. Blood splatters against the wall behind him. The camera then zooms out and the horde of zombies can be seen approaching Steel. John is being attacked by a zombie. He pushes the zombie back and shoots it. When he tries to go up the ladder, another zombie attacks him. When he aims at this second zombie, McDermott is faster and shoots it before him. Rhodes being torn apart by the zombies is missing as well. His lower half is being dragged over the floor and the complete feeding scene afterwards is missing as well.